Manual vs. Electric – Which Toothbrush is Best for Your Mouth? At the end of the day – and at the beginning of the day – there are few things more important to good oral hygiene than brushing your teeth. But brushing only works if you do it the right way, using the right type of brush, for the right amount of time. You can say you brush your teeth twice a day, but if all you do is a quick once-over with a bad, worn brush for 10 seconds, that’s like saying you went jogging after walking 20 feet. When it comes to brushing your teeth effectively, what you use is almost as important as how you use it. This involves picking the right toothbrush, and that often involves a fundamental choice: electric or manual? There is nothing wrong with using a manual toothbrush. If used correctly and regularly, a manual toothbrush can be an effective way of removing the biofilm which, if left on your teeth, can turn into the plaque and bacteria that cause tooth decay, gingivitis, and gum disease. Problems arise, however, if the manual brush is used incorrectly, or if other limiting physical conditions such as arthritis make it difficult to do the necessary work to clean the teeth. For example, some folks have a tendency to brush too hard or fail to spend the necessary amount of time in each part of their mouth. 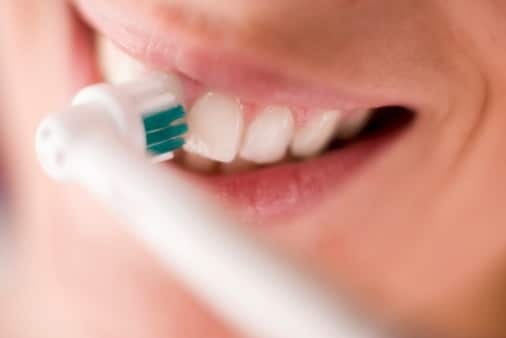 Additionally, many people do not move their brush around correctly, which involves holding your toothbrush at a 45-degree angle against your teeth and gum line, moving it back and forth in short strokes, then tilting it vertically and making up and down strokes on the insides of your teeth. A high-quality electric toothbrush can do a great job of minimizing the shortcomings that often accompany manual brushing and can take the guesswork out of the best brushing tactics. For example, many electric toothbrushes are wonderful for keeping you on task long enough. Typically, brushing for 30 seconds in each quadrant of your mouth should do the trick, and some electronic toothbrushes will automatically vibrate every time you should move on to the next section of your mouth. Additionally, without an electronic toothbrush, you’re forced to work your wrist in order to make the oscillating and pulsating effects of an automatic brush. A spinning brush glides in an orbit motion across each tooth, causing minimal strain to your hand and arm. But the best toothbrush is the one that you put into your mouth twice a day. Good brushing habits are a cornerstone of oral health, as are twice yearly dental visits, and will keep your mouth looking and feeling its best. Good dental habits can play a huge role in the health of your teeth and gums, as well as improve your overall health and well-being. At Assure A Smile in Miami, we partner with our patients to help them develop healthy, natural, and effective oral hygiene habits as part of an overall wellness strategy and holistic healthcare approach. To learn more about the importance of holistic dentistry and how to develop healthier habits, please contact us today at 305-274-0047.